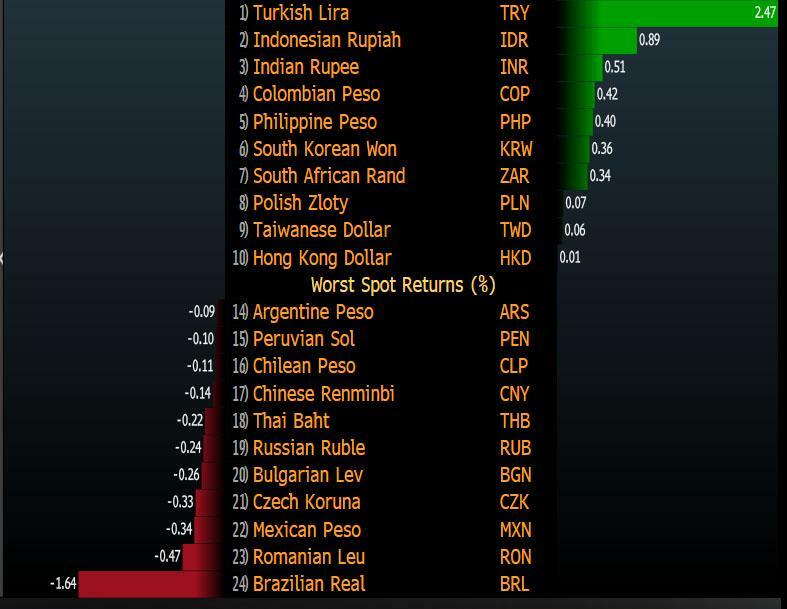 After days of getting pounded, today the Turkish Lira is the world's best performing currency (even as the Brazilian real is getting crushed over the ongoing Trucker strike while the oil-worker union is about to stop work too) after overnight the Turkish central bank announced it was revamping its interest rate corridor, allowing it to tighten liquidity. ... is that starting June 1, it would return to the structure of rates it was operating in 2016 with the one-week repurchase rate being the benchmark policy rate and the overnight borrowing and lending rates setting the bounds of the standard interest rate corridor. Meanwhile, the current main policy rate, the late liquidity rate, will instead become again a rate used in exceptional circumstances when individual banks face a temporary liquidity short fall. The TCMB set the one-week repo rate at 16.5% and therefore at the level of the current main policy rate, the late liquidity rate, which it hiked by 300bps last week. The overnight lending and borrowing rates will be set 150bp above and below the one week repo rate, in other words overnight lending rises from 9.25% to 18% while overnight borrowing jumps from 7.25% to 15%. In the statement, the TCMB also announced that the late liquidity rate will be set 150bp above the overnight lending rate, i.e. currently 19.5%. As Bloomberg notes, "the absence of a single policy rate has long been criticized by investors who say it creates policy uncertainty." The use of a wide interest-rate corridor and multiple interest rates that began under Erdem Basci, Cetinkaya’s predecessor, allowed policy makers to adjust the cost of cash provided to commercial banks daily if they decided it was needed. 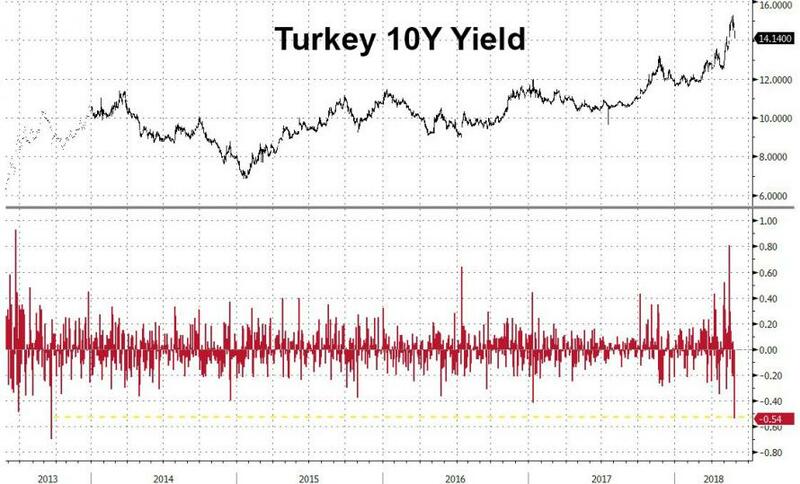 In kneejerk reaction to the implicit tightening and the attempt to stabilize the currency crisis, the yield on 10-year Turkish bonds plunged 53 basis points, the most since 2013, to 14.14%, while the Borsa Istanbul 100 Index climbed 3%, its biggest jump in more than a month. Commenting on the move, SEB FX strategist Per Hammarlund said that "the selloff has tipped the balance in favor of increased central bank independence" adding that "a reversal of this stance and increasing political influence over monetary policy is unlikely in the coming months." In other words, Per is an optimist, and is convinced that Erdogan has learned his lesson to stay away from the central bank after last week's crash. 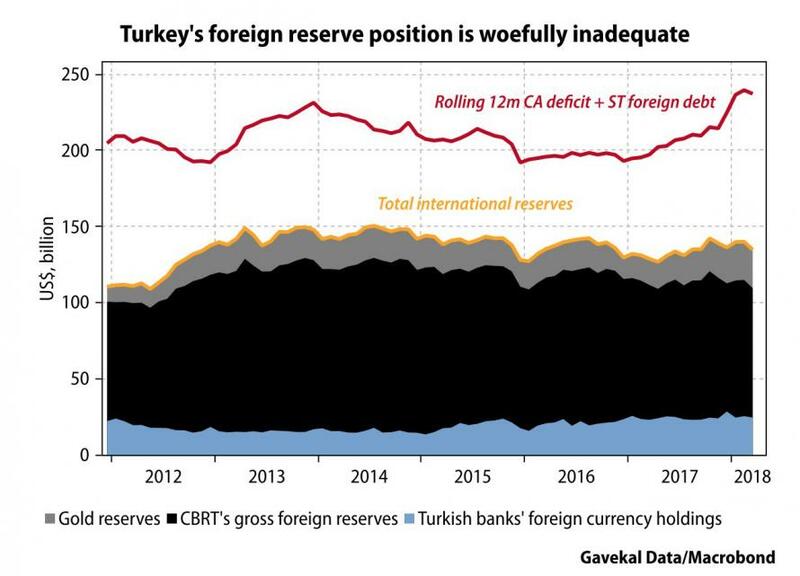 Spoiler alert: the fact that things are now somewhat stable will only embolden Erdogan to push even more to also dominate monetary policy. That said, those who are happy at today's developments will be able to indulge in even more Turkish exposure shortly: central bank governor Murat Cetinkaya and Deputy Prime Minister Mehmet Simsek are planning to meet with investors in London today (unclear why as it is a holiday) and tomorrow. Then again, even the most ardent Turkophiles may have had enough the "combination of a rising dollar, double-digit inflation, a widening budget deficit and Erdogan’s plan to have more say in monetary policy spurred a flight from lira assets" per Bloomberg. Meanwhile, according to Hammerlund, "the real test of CBRT independence will come when the lira has strengthened, but inflation and inflation expectations remain high,” the FX strategist told Bloomberg. "For the time being though, the gains in the lira will be sustainable, putting 4.40 within striking distance against the dollar." In other words, as the inflationary feedback loop accelerates, and ends up draining even more reserves, Turkey will find itself in the untenable situation where only pushing its currency even weaker will stabilize the economy, which in turn will restart the currency crisis and potentially lead to far greater economic and political fallout. In short: like it or not, Erdogan will soon be facing an acute social, political and economic crisis of his own inside Turkey.